Researchers often assume that possible worlds and times are represented in the syntax of natural languages. However, it has been noted that such a system can overgenerate. This paper proposes a constraint on systems where worlds and times are represented as situation pronouns. The Intersective Predicate Generalization, based on and extending work by R. Musan, states that two items composed via Predicate Modification, such as a noun and an intersective modifier, must be evaluated in the same world and time. To explain this generalization, a rule of Situation Economy is advanced, which holds that structures must have the fewest number of situation pronouns possible. Since strong DPs require a situation pronoun to receive a de re reading, a restriction on the type of strong determiners is proposed, which supersedes Situation Economy in this case. 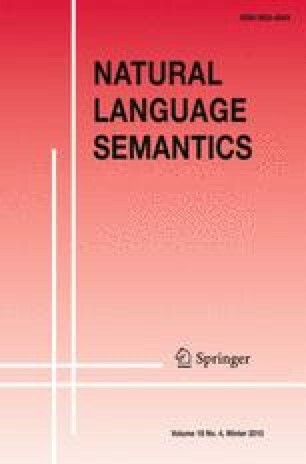 Finally, the paper shows how the Situation Economy approach explains an unrelated phenomenon involving bare plurals and examines the connection between this new rule and the grammar of natural language in general. Kratzer, A. 2007. Situations in natural language semantics. Stanford Encyclopedia of Philosophy: http://plato.stanford.edu/entries/situations-semantics/. von Fintel, K., and I. Heim. 2002. Intensional Semantics Lecture Notes, MIT. http://www.phil-fak.uniduesseldorf.de/summerschool2002/fintel.pdf.